Sung Sot cave is located in the center of the World Heritage Ha Long Bay, on Bo Hon island. 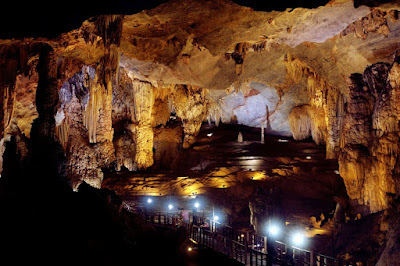 This is the largest and most beautiful cave in Halong Bay, especially Tourists to Halong Bay will admire many rocky islands which have unique shapes that nowhere has. Sung Sot cave is hidden behind the foliage and steep stone steps, tourists to Halong get both the pleasure of climbing and the exciting feeling like go up to the sky. Let Vietnam Typical Tours lead you the way to this heaven. Halong tourists will travel in the three regions, with a total area of 10,000m2, the cave’s gate is above 25 meters from the sea level. Cave is divided into 2 main compartments, the first room is super big. It’s like an opera house on Ha Long Bay. The second compartment leads to a small road and open up a whole different scene, with a vast cave, can accommodate thousands of people. If tourists go deep inside, they can discover many more interesting things. The most attractions are the cave ceiling with numerous stalactites forming bizarre shapes. Cave ceiling is covered with a layer of silky carpet, countless "chandelier" hanging by shining sparkling stalactites, stone statues, stone elephants, seals, raspberries, flowers. All of them become elusive between reality and dream world. Not only amazed at the magical beauty first stop but also surprised when we entered the second compartment by a small road. A stream burst into brilliant light, cave opens up a completely new scenery strange, vast banks can accommodate thousands of people. Go into the decor was very strange things , like the tree lush foliage , sea bears , dinosaurs. Go to the highest point of cave gate, unexpected area " garden" opening up for us, there crystal-clear lakes, charming scenery, trees of all species of birds and many species live. Monkeys often pull together down here looking fruit making noisy the whole region. Being Really shocked when tourists have chance to see 30 meter-high cave ceiling, with prints of small dimples regular and smooth as was decorated with foam to create the feeling of being watched by a magnificent ceiling so Opera house. 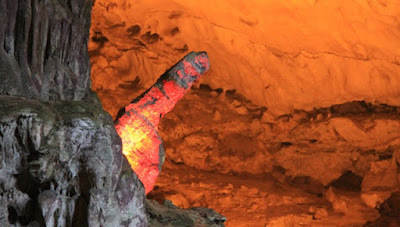 Right next to the entrance, visitors will see the human stalactites and long sword , was told in the legend of Saint Giong. Sung Sot cave is not only tourists to Halong "appalled " by the shimmering beauty that nature has bestowed favors, Sung Sot cave is one of the typical karst caves, valuable high science discovered by the French in 1901. Why do not you try to become a tourist by Halong tours to discover the mysterious beauty here.